After 1500, as Catholic Europe fragmented into warring sects, evidence of a pagan past came newly into view, and travelers to distant places encountered deeply unfamiliar visual cultures, it became ever more pressing to distinguish between the sacred image and its opposite, the 'idol'. Historians and philosophers have long attended to Reformation charges of idolatry - the premise for image-breaking - but only very recently have scholars begun to consider the ways that the idol occasioned the making no less than the destruction. 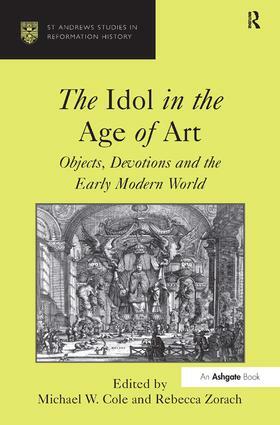 The present book focuses on how idols and ideas about them matter for the history of early modern objects produced around the globe, especially those created in the context of an exchange or confrontation between an 'us' and a 'them'. Ranging widely within the early modern period, the volume contributes to the project of globalizing the study of European art, bringing the continent's commercial, colonial, antiquarian, and religious histories into dialogue. Its studies of crosses, statues on columns, wax ex-votos, ivories, prints, maps, manuscripts, fountains, banners, and New World gold all frame Western 'art' simultaneously as an idea and as a collection of real things, arguing that it was through the idol that object-makers and writers came to terms with what it was that art should be, and do. Contents: Introduction, Michael W. Cole and Rebecca Zorach; Capricious arts: idols in Renaissance-era Africa and Europe (the case of Sapi and Kongo), Suzanne Preston Blier; Reforming idols and viewing history in Pieter Saenredam's Perspectives, Celeste Brusati; Perpetual exorcism in Sistine Rome, Michael W. Cole; The golden calf in America, Thomas Cummins; The grotesque idol: imaginary, symbolic and real, Claire Farago and Carol Komadina Parenteau; The shadow of the wolf: the survival of an ancient god in the frescoes of the Strozzi chapel (S. Maria Novella, Florence) or Filippino Lippi’s reflection on image, idol and art, Philine Helas and Gerhard Wolf; Ex-votos: materiality, memory, and cult, Megan Holmes; Ad fontes: iconoclasm by water in the Reformation world, Donald A. McColl; 'Nor my praise to graven images': divine artifice and the heart's idols in Georg Mack the Elder's painted print of The Trinity, Walter S. Melion; Idolatry and Western-inspired painting in Japan, Mia M. Mochizuki; Creaturely-invented letters and dead Chinese idols, Dawn Odell; Full of grace: 'Mariolatry' in post-Reformation Germany, Larry Silver; Meditation, idolatry, mathematics: the printed image in Europe around 1500, Rebecca Zorach. Index. Michael W. Cole is Professor of Art History and Chair of the Department of Art History and Archaeology at Columbia University, USA. Rebecca Zorach is Associate Professor of Art History at the University of Chicago.